Representing one of the major developments of industrial robotics in recent years, collaborative robots are designed to work alongside human beings. Human-robot collaboration on the manufacturing floor is paving the way for unprecedented efficiency and productivity. The present article will discuss the ongoing efforts aimed at enhancing the capabilities, widening the applications, and overcoming the physical security implications of collaborative robots. It will also present the federal R&D tax credit opportunity available for companies engaged in constructing a new paradigm, where humans and robots become coworkers. Collaborative robots are here to stay. Increasingly, they are being integrated into real-world manufacturing settings, where they work together with humans. They are responsible for a shift in the business model of robots, from machines to labor. These paradigm-shifting robots, which often present humanlike characteristics, are designed to operate in human-occupied spaces without many of the safety constraints required in the past. In other words, they are “cage-free”. The combination of physical proximity and anthropomorphism has shed a new light on the potential collaboration of humans and robots, establishing a novel, somewhat natural connection between them. I. Kinematic Redundancy: the development of a 7 degree-of-freedom manipulator, or the 7-axis arm, has been crucial to perfecting the movements of collaborative: robots. 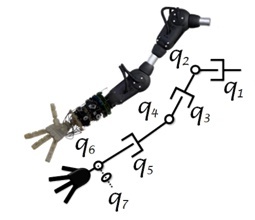 A significant evolution from traditional robots, which usually feature 6 axes, this innovative configuration mimics the human arm and enables a wider variety of forms and shapes of the robotic arm when performing a given task. Particularly useful for robots working in crowded spaces, the 7 joints allow them to swivel their elbows around to get out of the way of people or objects while maintaining their grasp in one location. Figure 1: Example of a 7-axis arm. II. Force-Torque Sensing: for safety reasons, collaborative robots often incorporate power and force limiting features. Force-torque sensors give robots a sense of feeling and are used to adapt the effort engaged in performing different tasks. They also make sure the robot stops and adapts when reaching a certain threshold or unforeseen resistance. For instance, a robot knows the exact amount of force required to insert a shaft into a hole. When sensors detect an increase in resistance, due to misalignment, for example, it automatically adjusts its movements and position to properly accomplish its task. In addition to preventing harm, such as a broken shaft, force-torque feedback is crucial to applications that require precise force to achieve quality results. Expected to be one of the next big advances in the robotics industry, force-torque sensors are an essential aspect of major ongoing R&D efforts. Incorporating this technology into a wider range of applications would enhance accuracy and precision of robots and pave the way for progress in areas such as haptic technology and teleoperation. III. Collision Detection: most collaborative robots are capable of detecting unexpected contact with objects or humans. Collision sensors are designed to prevent costly damage caused by crashes as well as dangerous accidents involving human workers. In some cases, robots are programed to suspend their full-speed mode and enter a compliant mode when contact is detected, meaning that they can be easily pushed away. Others are designed to simply back off at the slightest human contact, enhancing security at the workplace. By incorporating technologies such as force-torque sensors and collision detection mechanisms, collaborative robotics has rendered many of the safety measures that have traditionally segregated robots from humans obsolete. Such measures considerably limited the tasks that robots could perform, preventing both robots and humans from realizing their full productive potential. Not only do collaborative robots allow for a surge in productivity, but they do so in humans’ terms. The so-called “human-scale automation” makes sure that no major changes in the workplace are necessary to welcome collaborative robots. Machine layouts and factory floor plans stay the same, people rule. Though presenting common traits, robots capable of collaborative operations come in many forms. In fact, a growing number of robotics companies are investing in new and improved collaborative solutions. The following paragraphs will present the latest developments by some of the most preeminent companies in this field. 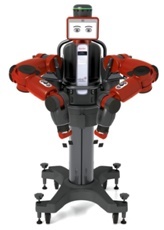 Manufactured by Rethink Robotics, Baxter has redefined the way robots can be used in manufacturing environments. The dual-arm humanoid was introduced in September 2012 and has since been incorporated by a wide variety of companies, including many that had never considered a robotic automation solution before. Among Baxter’s potential applications are kitting, packaging, loading and unloading, machine tending, and material handling. Weighing 165 lbs., Baxter has two 7-axis arms connected to a torso, each of them capable of lifting up to 5 lbs. It features an LCD display for an animated “face” that reacts to human interaction. Additionally, Baxter has a built-in 360 sonar and front camera sensors to detect humans presence, integrated vision for movement and object detection, and interchangeable end-effectors for easily switching tasks. Baxter requires no complex programming or costly integration. It presents behavior-based “common sense”, or intuitiveness. In other words, it is capable of sensing and adapting to a task or environment. Baxter’s $25,000 base price has made it an affordable solution for a growing number of businesses. Regular software releases promise to improve the robots’ capabilities. Such is the case for the 2014 Intera 3, which enables Baxter to perform with over twice the speed, precision, and motion quality of its flagship version. As more and more leading U.S. manufacturers purchase Baxter, improvements in functionality, manufacturing processes, and software development should follow. The MIT Technology Review has listed developments related to the Baxter Robot as one of the top ten R&D opportunities of the future. Headquartered in West Carrollton, OH, Yaskawa Motoman is an American subsidiary of the Japanese company Yaskawa Electric Corporation. With nearly 300,000 Motoman robots, 10 million servos, and 18 million inverter drives installed globally, Yaskawa provides automation products and solutions for virtually every industry and robotic application. The company has over 175 distinct robot models in its product line, which includes the innovative Motoman SDA, a series of 15-axis robots. Available with 11, 22, and 44 lbs. 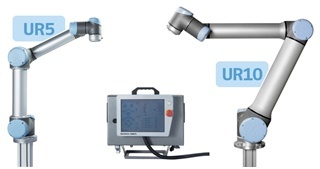 handling capacities, SDA robots offer ultimate flexibility due to two 7-axis arms plus waist rotation. This groundbreaking solution combines a compact footprint with “human-like” dexterity, which makes it ideally suited for assembly, part transfer, machine tending, packaging, and other handling that formerly could only be done by people. SDAs’ arms can work together or perform simultaneous independent operations. This line of robots uses a FS100 Controller, whose unmatched open architecture enables software customization in widely accepted environments such as C, C++, C# and .NET. Yaskawa is an advocate of collaboration through control. For this reason their controllers offer a “Functional Safety Unity” (FSU) that respects the most recent AINSI standards. The system features safety-rated monitored stops, along with speed and separation monitoring. Safety-rated lasers and sensors are also part of the system and are used to detect the presence of humans in collaborative environments. All sensors used in FSU have built-in fail-safes, meaning that two different pieces of software and hardware perform cross-checking for each and every signal received. If either of the two drops, the system goes into a safe condition. In the following video, Erik Nieves, Technology Director for Yaskawa Motoman in Miamisburg, Ohio, presents the functional safety features of Motoman robots. Danish company Universal Robots works to make robot technology available to all. It has developed a highly specialized, flexible, and low-cost robot arm that can be used in almost any industry, particularly where traditional robots are too large, expensive, noisy, or inflexible. The UR series comes in two models, with 11.3 and 22.6 lbs. payload 6-axis arms. Perfect for repetitive, mundane tasks, such as loading and unloading, Universal Robots are collaborative, or capable of operating without safety fencing after a risk assessment is conducted. Designed to work as production assistants, URs are pioneers of automation in industries and applications where manual operations have traditionally prevailed. Very easy to use and set up – installation can be done in less than one hour - the UR is more taught than programmed. This “teachability” has driven workers closer to robots and empowered them to actively take part in the automation process. Universal Robots lightweight, portable arms have been widely adopted by small to midsized companies who seek fast, easy, and affordable automation. In order to keep up with a growing demand, the company has recently opened a new 129,000-square-feet production facility. German manufacturer of industrial robots and solutions for factory automation, KUKA is the creator of the LBR iiwa, a highly sensitive robot for industrial applications. The 7-axis arm has a “light touch” particularly suited for sophisticated assembly tasks. LBR stands for “Leichtbauroboter”, which means lightweight in German, and “iiwa” is an acronym for “intelligent industrial work assistant”. This revolutionary line of extremely sensitive robots, has enabled automation in areas where it was previously impossible or not economically viable. Made entirely of aluminum, the LBR iiwa is very portable and provides outstanding payload-to-weight ratios. It comes in two models, capable of handling payloads of 15.4 lbs. and 30.8 lbs., and weighing 52.6 lbs. and 65.9 lbs., respectively. The LBR iiwa stands out for its extremely high sensitivity, which is seen as a prerequisite for the safety of humans and materials. It uses power and force limiting features, which enable direct contact with a person. This is possible due to torque sensors built into each one of its seven joints. Additionally, it features a highly responsive collision detection system. Designed for direct interaction with humans, the LBR iiwa features iconic design and style that reduce risks of injury in human-robot collaborative applications. Its organic shapes, soft edges, and smooth flexibility won the Red Dot Award: Product Design 2014. Also, the LBR iiwa has a teaching by demonstration feature, which empowers human operators, leaving the need for programming skills behind. The following video shows this feature in action. As a result of years of research and development, Swiss industrial robots supplier ABB unveiled, on September 9th, the YuMi, an innovative, human-friendly, dual-arm robot. With breakthrough functionality, YuMi is designed for a new era of automation, where people and robots work hand-in-hand. The name “YuMi” is short for “you and me” working together. The new small parts assembly robot solution includes flexible hands, parts feeding systems, camera-based part location, and state-of-the-art robot control. It also features innovative force-sensing technology built into its soft padded arms, which ensures a safe incorporation to the work environment. Offering great flexibility, agility, and precision, the novel collaborative robot was primarily developed to meet the needs of the consumer electronics industry. Modern electronics manufacturing plants must keep up with constantly changing product requirements, which call for modular and adaptable automation. According to ABB, YuMi can handle everything, “from the delicate and precise parts of a mechanical wristwatch to the components used in mobile phones, tablets, and desktop PCs”. YuMi will be commercially available in April 2015. It is expected to unlock vast additional automation potential in the consumer electronics industry and to be gradually rolled out to cover other market sectors. 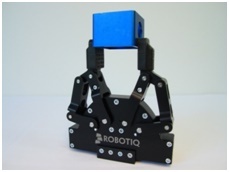 Founded in 2008, Canadian company Robotiq designs and manufactures adaptive grippers for collaborative robots. Their approach consists of embedding mechanical intelligence into devices in order to simplify integration and increase system performance, enabling a next generation of industrial and service robotic applications. Robotiq’s 2 and 3-finger adaptive grippers offer outstanding flexibility and are easily integrated with the collaborative robots available in the market. The idea is to provide companies with a flexible, multiuse, programmable tool, capable of grasping a wide range of parts with control of the stroke, force, and grip type. The company offers installation kits for the UR, KUKA’s LBR iiwa, and the Baxter Research Robot. The gripper runs on the same controller as the robot and appears on the teach pendant interface. By reducing tooling costs and eliminating changeovers, Robotiq’s hands can maximize returns on investments for collaborative robotics products. The following video shows a UR robot with a Robotiq 2-finger gripper performing a machine tending demonstration. Though collaborative robots have been more widely engaged in industrial applications, innovative solutions aim to consolidate their presence in the services industry. Headquartered in Pleasanton, California, Adept Technology Inc. manufactures autonomous mobile solutions for dynamically moving materials. The Adept Lynx is a self-navigating Autonomous Indoor Vehicle (AIV) capable of intelligently moving around people and unplanned obstacles, even in challenging environments that may include confined passageways. Lynx does not require facility modifications and is particularly suited for pharmaceutical, medical, and laboratorial operations. Yet another solution for delivering materials, the SaviOne was designed to serve the hotel industry. This innovative, services-oriented robot is the creation of Savioke, a robotics startup from Sunnyvale, CA who recently raised $2 million in investments from Jerry Yang’s AME Cloud Ventures, Google Ventures, Morado Venture Partners, among others. Currently being piloted at the Aloft Hotel in Cupertino, CA, the SaviOne should be rolled out into more hotels over the next year. 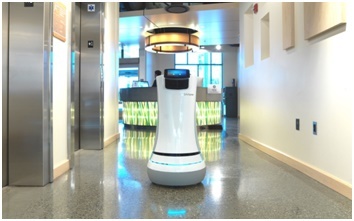 The 3 feet tall robot weighs less than 100 lbs., has a carrying capacity of 2 cubic feet, and can travel independently between floors via the hotel elevator. By delivering goods securely and efficiently to hotel guests, the SaviOne enables the staff to save time and focus on guests’ needs. As fast-paced collaborative technologies evolve, safety regulations tend to struggle to catch up. For this reason, safety is still one of the main issues surrounding collaborative robotics. The latest international ISO 10218:2011 and U.S.-adopted ANSI/RIA R15.06-2012 safety standards establish that collaborative operations must meet at least one of the following criteria: 1) Safety-rated monitored stop; 2) Hand guiding; 3) Speed and separation monitoring; or 4) Power and force limiting. The vagueness of current standards can be explained by a difficulty in addressing each and every one of the myriads of potential applications of collaborative robots. In that sense, companies must devote their efforts to assessing and mitigating the risks surrounding their products. Investing in new and improved safety solutions is a major area for collaborative robotics R&D and one that can entail significant federal R&D tax credits. New, more specific international regulations should be released soon. The industry expects them to provide more guidance on how to effectively conduct a risk assessment of collaborative robots. By combining the dexterity, flexibility, and problem-solving capabilities of human beings with the strength, endurance, and precision of robots, collaborative robotics promises to revolutionize almost everything, from manufacturing facilities to offices, schools, and even homes. Though advances made so far are beyond remarkable, there is still a lot of room for improvements. R&D efforts are underway to create new software that make programming collaborative robots even easier, possibly using speech. The deeper integration of artificial intelligence and the development of a “common sense” in robots is yet another promising area for innovation. Experts also consider the need of improving robots’ “social intelligence”, which consists of small traits and features that will favor a seamless and friendlier interaction with humans. Advances in this area are key to a new breed of “home assistance” or “companion” robots, which can one day change the face of in-home care. The future of collaborative robots may even bring innovative payback scenarios. Based in Holland, Michigan, Steel Collar Associates distributes Motoman dual-arm robots as contract employees. Understanding that some users may want to expense a part of their automation as opposed to capitalizing it, the startup is the first temp agency for robots. 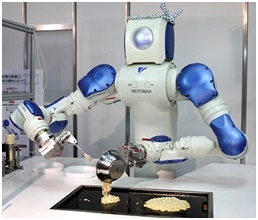 Collaborative robotics R&D is expected to become increasingly human-centric. Innovative efforts tend to place the human at the center of the entire design, creating robots that are capable of adapting to humans (and do not require human adaptation). The ultimate objective is to enhance multi-modal communication in such a way that robots will be able to recognize human gestures and motion intentions, without the need for voice commands. By teaming up with people, collaborative robots have the potential to trigger a real robotics revolution. They are here not to replace people, but to empower them. Scalable, flexible, and easily implemented, collaborative robots serve as workforce multipliers, enabling new levels of productivity and efficiency. The future of human-robot collaboration is exciting to say the least. Federal and State R&D tax credits are available to help us get there.